Summer is a time for family vacations, backyard barbecues and plenty of outdoor activities with food as the centerpiece. But before those steaks and burgers go on the grill, the U.S. Department of Agriculture’s (USDA) Food Safety and Inspection Service (FSIS) wants to remind consumers to keep their family and themselves safe from foodborne illness by using a food thermometer to ensure meat and poultry are cooked to the correct internal temperature. 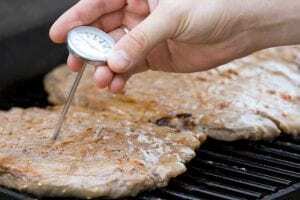 Recent research by USDA and the Food and Drug Administration (FDA) found that only 34 percent of the public use a food thermometer when cooking hamburgers. If you don’t verify your burger’s internal temperature, pathogens may still be present. When eaten, those hamburgers can make your guests and your family sick. In fact, the U.S. Centers for Disease Control and Prevention estimates that 48 million people suffer from foodborne illness each year, resulting in roughly 128,000 hospitalizations and 3,000 deaths. So how do you avoid becoming a part of those statistics? Follow USDA’s four easy steps to food safety this summer. Clean: Make sure to always wash your hands and surfaces with soap and warm water for 20 seconds before cooking and after handling raw meat or poultry. If cooking outside or away from a kitchen, pack clean cloths and moist towelettes for cleaning surfaces and hands. Separate: When taking food off of the grill, use clean utensils and platters. Don’t put cooked food on the same platter that held raw meat or poultry. Cook: Always use a food thermometer to check the internal temperature of meat and poultry. Place the food thermometer in the thickest part of the food. Hamburgers, sausages and other ground meats should reach 160°F. All poultry should reach a minimum temperature of 165°F. Whole cuts of pork, lamb, veal, and of beef should be cooked to 145°F as measured by a food thermometer placed in the thickest part of the meat, and allowed to rest for three minutes before eating. A “rest time” is the amount of time the product remains at the final temperature after it has been removed from a grill, oven or other heat sources. During the three minutes after meat is removed from the heat source, its temperature remains constant or continues to rise, which destroys pathogens. Fish should be cooked to 145°F. sure items have reached a safe minimum internal temperature needed to destroy any harmful bacteria that may be present. Chill: Place leftovers in shallow containers and refrigerate or freeze immediately. Discard food that has been sitting out longer than two hours. 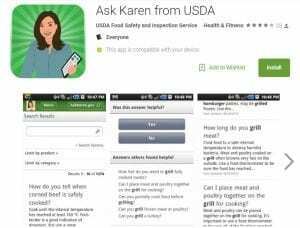 Need more food safety information? Call the USDA Meat and Poultry Hotline at (1-888-674-6854) Monday through Friday, from 10 a.m. to 6 p.m. ET, or email or chat at AskKaren.gov.